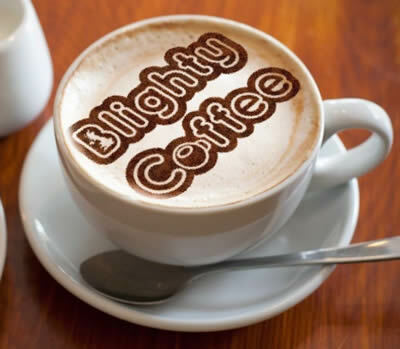 Chris Evans, the owner of Blighty Coffee, an independent coffee shop and community in Finsbury Park, North London came to 2020Media with a problem. Customers in his shop were complaining the WiFi was unreliable. Chris has invested in the fastest broadband service in the area, from Virgin Media Business, and gets a connection speed of over 40Mbps. The connection terminates on a Virgin Media router, and attached to this was an Asus Wifi booster which had been added in an attempt to solve the problem. Although the Wifi service was capable of high speeds, it was not providing a reliable connection to clients, and there was no way for management to know of the problem unless a customer complained. 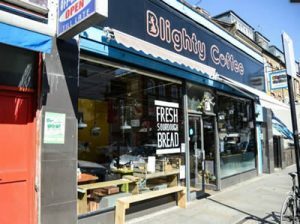 Blighty Coffee is a community-led coffee house on Blackstock road, Finsbury park, London, serving home made food and quality coffee. Coffee is roasted and ground on site, with three regular blends being produced – The Winston blend , the Clementine blend and The Blake blend. Food comes in the shape of fresh, healthy ingredients from local suppliers. 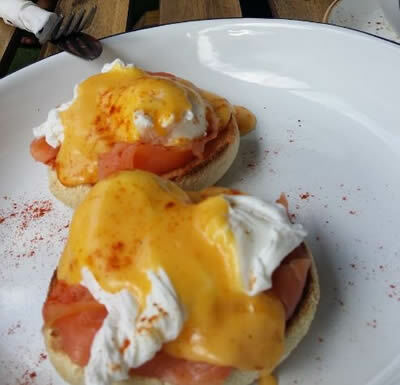 Fresh food is created daily on site and menu comprises British cafe favourites like Eggs Benedict and Welsh rarebit to fresh sandwiches, locally made cakes, salads and soups. Coverage of WiFi was challenging as there are several spaces for customers. These vary from the cafe area on the ground floor to a secluded garden to a vintage lounge on the 1st floor. Co-founder of Blighty, Chris Evans hails from Shropshire though now calls London home. He has a background in tech and has been working in the internet industry for 5 years. He lists his skills as sales, marketing and new ideas/projects. Chris can often be found eating sushi or supping on a fine English ale. Reliability. Increasing use of mobile devices for customers, staff and in-house equipment. Therefore the wireless network needs to be robust and reliable. Ease of management.Configuration, control and reporting from the wireless network should be pain-free and intuitive. Control over use. With no control offered by typical consumer broadband routers, some guest WiFi services end up being used by all and sundry for massive downloads, inappropriate (possibly even illegal) content, and piggy-backed by neighbours. The primary reason Chris was looking for a new solution was reliability. He was frequently called in by his staff, and regulars because the existing WiFi service wasn’t working. 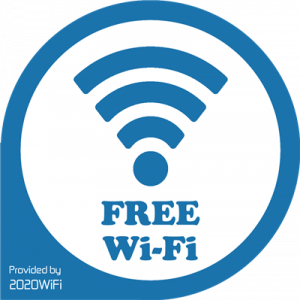 Clearly WiFi was a service that customers expected to be available in any Coffee Shop, and the unreliable service was starting to cause real problems. Chris had no way of knowing there was a problem until it was reported – in most cases by a frustrated customer. He then had to come in and power cycle the existing equipment. In an effort to make the WiFi service more reliable, Chris put in an expensive dedicated WiFi extender device. Although this did boost the coverage area, it did not make the service any more reliable. It was also a closed-system, with no management facility. 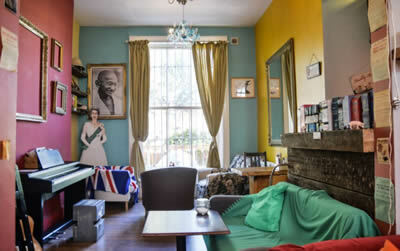 Blighty Coffee is a large building with lounges on different floors, and a garden at the rear. Although not of primary importance, Chris does want to offer coverage to as much of the area as possible. Our first step when Chris contacted us, was to discover what the underlying problems were – we often find cafés, bars, resturants and shops have a specific problem they want to solve. We put this top of the list but also explain how our WiFi hotspots benefit the business in many other ways too. As Chris’s WiFi was in place already but was unreliable we decided a site visit would be useful and arranged a time and date to suit his busy schedule. A site visit is not necessary in most cases, but we wanted to understand what could be causing the unreliability – there can be a range of reasons from equipment to physical location. We determined that the siting of the existing equipment was not optimal for the best coverage and that the WiFi extender unit may have been locking up on a regular basis. There was no way of knowing when this happened unless a customer complained. We arranged a free evaluation of our service using the MR18 Meraki indoor wifi hotspot. It was important to prove the service was more reliable than what he had already, so this kind of evaluation is something we offer to most venues where there are existing problems. Alerts are emailed if the hotspot is unreachable from our monitoring. This enables any problem with the underlying internet connection (which is from a third-party, not 2020Media) to be proactively investigated, as well as providing data on just how long broadband outages have been. Our WiFi hotspots automatically reconnect to the cloud after any interruption to the internet connection. Our devices are plug-and-play. Simply plug in, connect to your router with supplied network cable (we will check the length of cable you need), and your service will up and running in less than 5 minutes. All configuration is done via the web management portal. Better coverage. The MR18 Meraki hardware includes 3 radios, 2.4 and 5 GHz with 600Mbps throughput. We sited the hotspot in a new location that provides better all round coverage. Because the devices support Power over Ethernet (PoE), we are able to run just a single network cable to the new location, and the power supply was located in a more convenient place. Additional secure WiFi Networks. A staff only network has been created. Blighty has recently moved to a web terminal POS system, a seperate secure WiFi network was essential for this to operate with no sharing with customer WiFi connections. Seperate firewall rules allow local wired network connections such as kitchen and receipt printers to be shared with the WiFi terminals. Rich statistics on new customers, guest loyalty (repeat vs new visits), and time spent in Blighty Coffee. Reliable. Call outs for non-working WiFi are now a thing of the past. Secure. Dedicated secure network for new wireless till system. Coverage. Better WiFi network coverage throughout Blighty Coffee. Now Chris gets a weekly report on his WiFi service, directly to his Inbox. Our ongoing support means new networks can be added, existing services can be adjusted and we are here 24/7 for any queries. If there are problems with his broadband provider’s service, we can provide data on exactly when these occurred. One. With careful positioning full coverage achieved.